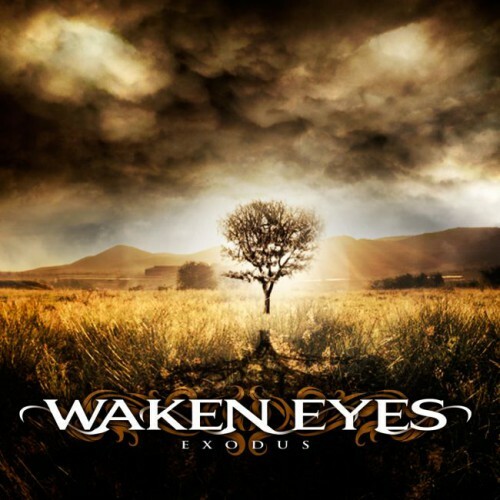 Review: Waken Eyes – Exodus – Ulterium Records – Release: October 30, 2015. Looks can be deceiving as it turns out. If you’d look at the Facebook page of Waken Eyes you’d think that it was just a small band going by the (now steadily growing) number of likes. A project of Tom Frelek? Doesn’t ring a bell, I’m afraid. But then you see he’s got Mike Lepond of Symphony X, Henrik Bath of Darkwater and Marco Minnemann of tons of things to join him and you start thinking. Get ready to enter one of the most full-grown and well thought-out debut albums in years with “Exodus”! Be welcomed with a nice keyboard driven intro in ‘Cognition’ and you’ll soon get a slight taste of the melodic and progressive metal/rock offered to you by the aforementioned names. Clearly this is no third-rate band, something’s about to go on. And then it starts with ‘Aberration’, a highly melodic attack on your senses, those are some addictive lead guitars lines right there! Henrik’s smooth and mid-deep vocals gently bring you into the song before he goes into his bigger range. It’s pretty daring to use an eight minute track for opening up your album, but you do get to make sure you can give each part of the song proper playing time. And this isn’t even the longest song on the album! The overall song durations are pretty long, but they will never bore you, I can guarantee. The songs are so diverse and catchy, you’ll instantly get hooked. This isn’t due in the least to the high skillmanship of the musicians. I reckon most readers will at least be familiar with Mike and Marco and their expertise is given, setting an often exhilarating beat. Henrik might be a bit less familiar so far, but his other band Darkwater is steadily making heavier waves as well. And I have to lay down some major props to Tom for the songwriting and his guitar playing skills. You’d think this is a man who’d been around in the scene for lots of years, but there’s surprisingly little to his name. Those solos are killer! Let’s take a small dive back into the songs with ‘Back to Life’, the first song they released for the album and I’m pretty sure that this gained them a lot of followers. Starting with a highly melancholic guitar piece that’ll get you weeping if you’re already in a sad state its lyrics are very disheartening at first. Yet both musically and lyrically there’s light at the end of the tunnel. And after a slow and thoughtful song it’s time for some more fire and ‘Palisades’ deliver just that. After a dramatic and low key intro all engines are go for a short burst of melodic power metal. It’s almost a shame that it’s for a short duration if it wasn’t for the fact that this album really shines in its mid-tempo songs. Another real gem is ‘Cornerstone Away’, which starts quite minimalistic with a guitar and Henrik’s vocals, only for female vocals to suddenly pop up later on! I’m not entirely sure, but these appear to be done by Daísa Munhoz from Vandroya. Their voices mesh together perfectly, especially in the parts where the whole band comes together and their voices are at their most powerful. ‘Still Life’ is the shortest song on the album clocking in at less than five minutes and is a fully instrumental piece of work. Where bands often go into full fireworks, this song is actually pretty subdued, giving it a lot of strength. I’ll just end this review with the closing track, which is the album title song ‘Exodus’, a nearly twenty minute beast of a song, which could’ve easily featured as a multi-track EP of its own. The first two minutes of the track throw you off as they’re so laid-back, but when the track starts up in full energetic mode you’re in for a ride. It’s a diverse piece of music and it encompasses just about all the elements you’ve heard so far and more. It’s a highly fitting track to end the album and I’m very interested in seeing what the next step will be! I actually picked up this album for review on a whim, leafing through some smaller bands. Well, I sure was blown away by this brilliant piece of melodic & progressive work. I went into it not expecting too much, but as it turns out, this album will rank very high on my own yearlist!